Undeniably one of Country music’s hottest stars, Kelsea Ballerini continues to earn mainstream media attention for her magnetic personality with a co-hosting appearance on daytime TV’s THE TALK. Airing March 6 on CBS at 2 p.m. ET (1 p.m. PT/CT), Ballerini will be on hand to swap stories with hosts Julie Chen, Sara Gilbert, Sharon Osbourne, Aisha Tyler and Sheryl Underwood, and also celebrate the previous night’s 2017 iHeartRadio Music Awards. Ballerini was already revealed as the BEST NEW COUNTRY ARTIST winner in a pre-show announcement, and will compete for the all-genre BEST NEW ARTIST trophy at the live event, airing March 5 at 8 p.m. ET on TBS, TNT and TruTV. Her appearance on THE TALK adds to Ballerini's fast-growing list of co-hosting experience after teaming up with Arsenio Hall on ABC’s music-themed Greatest Hits series in the summer of 2016. More award show excitement is on the way, as the Black River Entertainment artist is up for two honors at the 52nd ACM Awards – Female Vocalist of the Year and Video of the Year for her visually stunning “Peter Pan” clip. The 52nd ACM Awards take place in Las Vegas on April 2, airing live at 8 p.m. ET on CBS, and Ballerini prevailed as last year’s ACM New Female Vocalist of the Year. 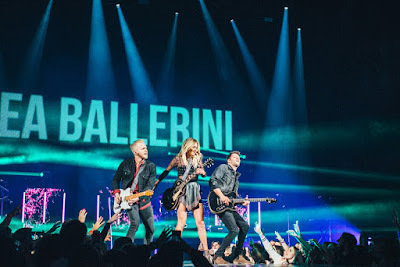 On February 23, Ballerini kicked off Thomas Rhett’s HOME TEAM TOUR as the featured supporting artist, thrilling fans with a weekend of shows in Michigan, Pennsylvania, and Illinois. She’ll continue on with Rhett until joining Lady Antebellum’s YOU LOOK SO GOOD TOUR on May 26 in Bakersfield, California. Meanwhile, Ballerini’s fun and flirty “Yeah Boy” is nearing Top 10 at Country radio. It’s the fourth single from 2015’s THE FIRST TIME, her GOLD-certified debut album, which introduced the proven star with three-straight #1s – “Love Me Like You Mean It,” “Dibs” and “Peter Pan” – a record for women in Country music.